Roast the poblanos directly over a gas flame or charcoal fire, or close under a preheated broiler, turning regularly until blistered and blackened all over, about 5 minutes over an open flame, 10 minutes under a broiler. Collect the chiles in a bowl, cover with a kitchen towel and cool until handleable. Rub off the charred skin, pull out the stems and seed pods and briefly rinse under cool water to remove bits of skin and seeds. Slice the roasted chiles into ¼-inch strips. Heat 2 tablespoons of the oil in a very large (12-inch) skillet over medium-high. When hot, add the sliced onion and cook, stirring regularly, until the onion is richly browned, but still a little crunchy, about 7 minutes. Then stir in the garlic and oregano. After a minute or so, when the garlic is fragrant, add the chile strips and crema, stirring nearly constantly until the cream has thickened enough to coat the chiles nicely, a couple more minutes. Taste and season the mixture with salt, usually about ½ teaspoon. Transfer the rajas a la crema to a bowl and wipe the skillet clean. Add the remaining 1 tablespoon of oil to the skillet and return it to medium-high heat. 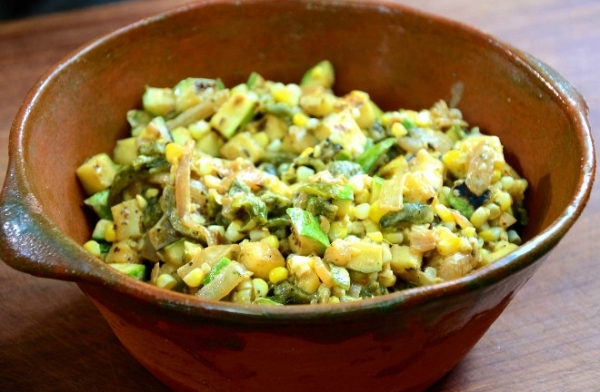 Add the zucchini and cook, stirring frequently, until richly browned all over, 8 to 10 minutes. Add the corn and let that brown, a couple more minutes. Scrape in the rajas a la crema, along with the epazote (or cilantro). Reduce the heat to medium and simmer, adding a couple more tablespoons of crema if the mixture needs it. Taste, add more salt if you want and scrape it into a serving bowl. Serve on warm tortillas topped with queso fresco sprinkled over the top. This looks so good. Different from meat tacos. Made this tonight for my familia and they loved it! Nice to have a non meat dish for dinner tonight! I was delicious and did not disappoint! We will definitely be making it again! Saw this recipe on TV earlier this week (KEET – Eureka, CA). I’m not a fan of non-meat recipes but we decided to try this one tonight for dinner. WOW! Killer meal!!! Thanks. Food looked incredible but I want to know the make and model of his glasses. I’m in NC, no one will know! Meatless Monday was a success. The only addition… Fresh squeeze of lime juice at the end. So delicious! 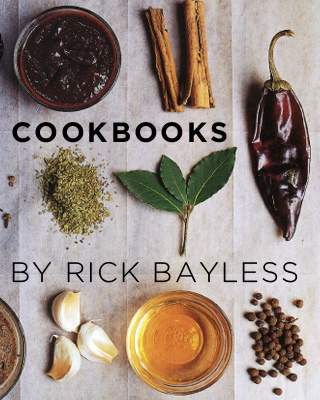 Rick Bayless, we miss you on TV. Enjoyed your lessons. Why don’t you put together some more programs?? Food channels, please help convince him! There are so few, new, worthwhile programs. All we’re seeing is re-runs. Am tired of wierd food Chopped, American and Canadian…Grocery contests etc. Some like The Kitchen are very worthwhile as is Bobby Flay and Giada but those are becoming monotonous after repeating so many times. Am going to make your rajas tomorrow. Just rcvd 30 poblanos. Am not going to use the 30 gift jalapenos tho, Can’t find a way to reduce their heat. Thanks for the recipe. We are still making shows! Season 10 was just nominated for an Emmy and we are filming Season 11 this year! Check your local PBS station for listings! Hello! I? ?ve lived in Mexico for 50 years and am not famiiar with mexican recipes that use yellow cornmeal. What is it translated into spanish or what could I use to substitute? The real thing from the states is very costly. As is polenta, which I think might be a subsitute? Gracias de antemano. This recipe didn’t call for cornmeal. I would think you could use corn masa in place of cornmeal. Polenta to me tastes and feels more like grits. Two things: Using a damp kitchen towel to cover the roasted chiles helps them steam better. If you rinse the chiles with water, you lose flavor. Use a paper towel to remove skin if you can’t do it with your fingers. One of our favorites! Especially during farmers’ market season here in Chicago. I made a vegan version of this recipe today, meaning I did not use crema. I found a vegan sour cream that I served as a condiment instead of adding it to the whole pan. Also, I used avocado as a condiment in the taco. The dish was beautiful and delicious. I will use this recipe again!